With most of the new info incorporated into new or existing articles, we’ve slowed the frantic pace of our post-Blizzcon wiki updates. There have still been a bunch of cool recent updates, though. Here’s a partial list. The Diablo III Basics article was extensively updated after Blizzcon. It’s the best single page resource for Diablo III information anywhere, and contains up-to-date info on literally every major aspect of the game. Classes, skills, respecs, traits, runestones, monsters, death, difficulty levels, end game, items, NPCs, Levels, Easter Eggs, Art Design, Quests, Story, PvP, B.net, Release Date, System Requirements, and many more. With links to all the individual articles, which go into much more detail. Remember the speculation from earlier this year, that the fifth character would be a short name, like “Rogue” or “Archer” since it fit neatly into the existing character navigation display on the official site? So what happened? How did they squeeze in “Demon Hunter?” By chopping a couple of words off of the “back” link, and then sticking the new class over on the far left. 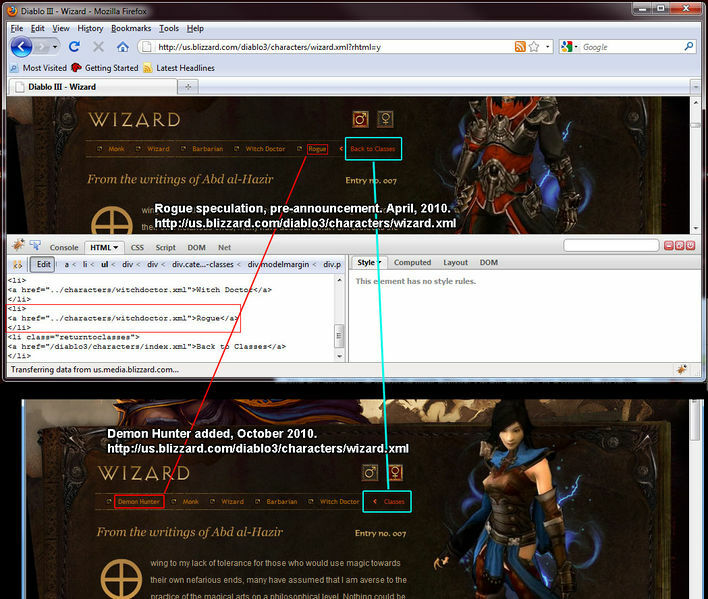 As the comparison screenshot demonstrates. This and lots of other interesting pre-DH speculation can be seen on the Other classes article. We’ve had all the class traits in the wiki since right after Blizzcon revealed them, but a newer article addition is the Traits Master List. This page catalogs all 80+ traits in the game, with the description and a list of the class(es) that possess it. This list is far from final, since existing traits will be changed around and the DH will obviously have more than 5, but it’s handy for quick comparisons and consultations in the meantime. The Resources page got a big makeover, and now lists basic info about all the class resources, every class skill and trait that directly impact resource regeneration, brief development histories of the resources, and more. You can, of course, get much more detailed info about each resource on the Arcane Power, Mana, Fury, and Spirit articles. The Gameplay Videos page is up to date, with links to pages that house all of the official Diablo III cinematics and gameplay movies, as well as tons of fan-shot shaky-cam footage. Fans often ask about what resolutions will be supported Diablo III (all of them) and how larger or smaller resolutions will be displayed. We don’t know everything yet, but from existing screenshots you can clearly see the difference between widescreen and 4×3 resolution. The display windows slide in from the sides in 4×3 mode, shrinking the width of the interface bar and the visible screen in the center. Check out the two comparison shots on the Resolution page for visual confirmation of this. Or wait a week to look and make it your New Year’s resolution. Finally, if you’ve ever wanted to help out on the wiki, and have some free time to fill over the Holidays, there’s a help wanted thread in the Wiki forum with a whole list of stuff that needs doing. Feel free, and if you’ve got questions or technical issues, posting them in that forum or on my talk page is the best way to get them seen and answered.